Congratulations to the dedicated volunteers who run our Bereavement Group for reaching the finals of The Comet Community Awards. Also to a Wendy Darnell a GP Carer Champion we work with for winning the Care Worker of the Year category. 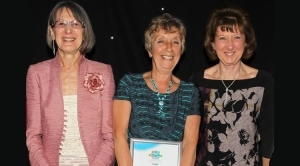 The group of 14 volunteers provide bereavement support for carers who have lost the person they cared for, and their hard work and commitment to helping others was recognised in the Valiant Volunteer category of the newspaper's awards.